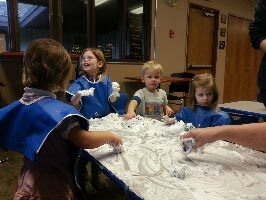 'Just You and Me' Playgroup - Our Savior's Lutheran Church and Preschool. Welcome to the ‘Just You and Me’ Playgroup! The ‘Just You and Me’ Playgroup is a fun time for playing, laughing and making friends together in a very relaxed environment. Playgroup is also a special time for parents, grandparents, caregivers and dads etc. to connect with others and have fun while playing and learning with their little ones. I believe each child and adult will bring unique and special qualities to our group. The “Just You and Me” playgroup meets on most Wednesday and mornings 9:00am to 10:30am, October through May. Sometimes playgroup is cancelled for a day due to a special school or church function. 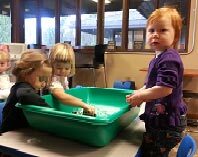 The Play group is free but donations are always appreciated for supplies. Please bring a simple nut-free snack and water for your child. Please call the director if you plan to join us for the first time. For preschool families who have older siblings at OSLCP, feel free to hang around in the “Tree of Life” Café after the playgroup session, chat with friends and enjoy a delicious latte while youngsters play with toys.